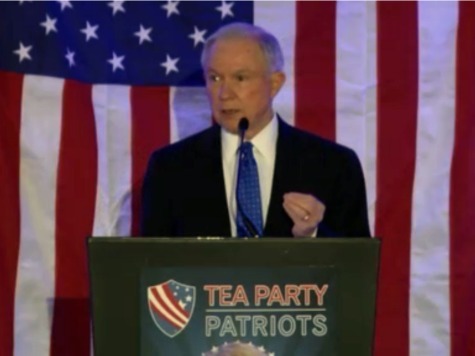 Senate Budget Committee ranking member Sen. Jeff Sessions (R-AL) said the Tea Party movement is essential to moving the country back in the right direction during his keynote address to the Tea Party Patriots fifth anniversary conference at a dinner at the Capitol Hill Hyatt Regency Thursday. They say you’re extreme. They push back and say you’re extreme. But I say extreme is running up $18 trillion in debt. Extreme is a 2,700-page healthcare bill that nobody could understand and is doing great damage to America. Extreme is a president who won’t enforce laws on the books and will enforce “laws” not on the books. Extreme is embracing immigration policy that validates illegality and triples the number of people who would be brought into our country in a time of high unemployment. Extreme is maintaining a debt path that is unsustainable. Sessions’ speech started to lay out more of his forthcoming economic agenda and why Republicans need to have a plan that sticks up for American workers rather than special interests on Wall Street or in Silicon Valley. Specifically, he argued that such an actual conservative economic agenda–one that would be in stark contrast to the Democrats’ leftist agenda and rejects special interests–is necessary from Republicans because the vitriol from Democrats is at all-time highs. “They [Democrats] accuse Republicans of being unkind, unloving, un-compassionate–of wanting to hurt people,” Sessions said. We’ve not been very good at responding. We’ll say things like, “that’s class warfare.” Now, that’s not a very strong thing to say. When they attack your very character, your very decency, your good will and motivation for America, and that you don’t like people hurting and have no desire for a plan that will not help–that you’re just “against them”–that’s the charge the left has made against us. We got to stand up to it. And we got to respond. We got to say it’s your policies that will trap millions in poverty and despair. We are determined to change it, and put this country and the American people on a pathway to prosperity and not dependence. Sessions offered statistics to illustrate just how bad the economic situation in the country really is–unemployment and underemployment remains unprecedentedly high, wages are stagnating, high numbers of recent college graduates are not getting hired, and companies are not hiring as many workers as they can because of regulations, especially Obamacare. He told a story of a business owner he met in Alabama recently who called himself a “49-er” because he hired only 49 employees, instead of 50-something, so as to avoid bumping his company into the next bracket of Obamacare requirements. He noted how one in five American households are on food stamps. Instead of listening to the American people, Sessions said the president has offered policies that hurt them economically. The Democrats in Congress, he said, have been no better. What did the president and his team do? What have they done? They’ve done–that rubber stamp from, I sometimes accuse them of being lemmings, Harry Reid and my Democrat colleagues, with affection–but this is their policy: An anti-energy policy, a regulatory policy that’s hammering small businesses, and costing us jobs and competitiveness, a healthcare policy that’s shrinking the workforce and diminishing the quality of healthcare, and a policy that enriches Washington, the most dynamic economic growth center in America. “They’re sucking up money from all over America so it can be spent on this God-forsaken capital,” he said, to laughter from the crowd. Contrasting that with a real conservative agenda–not something that simply pleases business interests and high-dollar donors–like something Sen. Mike Lee (R-UT) had focused his earlier speech on, Sessions said, could ensure Republicans win back the Senate with a “conservative Republican majority” instead of simply a GOP majority.